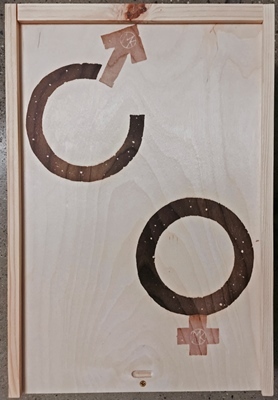 2013 Grenache and Syrah from Third Twin, Eleven Confessions, Cumulus, White Hawk Vyds. 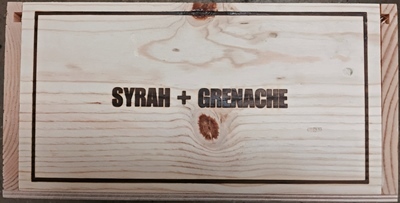 The Female Grenache is 78% Grenache, 19% Syrah and 3% Mourvedre. Aged about 24 months in 98% used oak. 88% whole clusters, 12% destemmed. 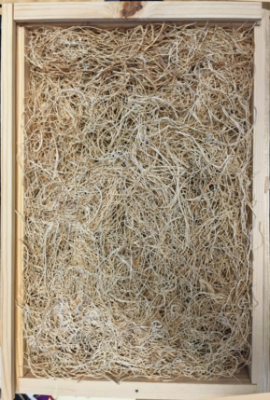 55% Eleven Confessions vyd, 37% Cumulus vyd, 5% Bien Nacido vyd, and 3% The Third Twin vyd. Alcohol is 15.7%. Acidity is 6.5 g/l. Finished pH is 3.84. 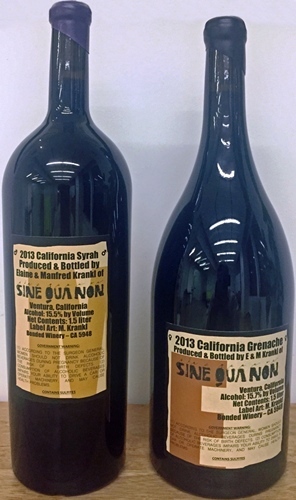 The Male Syrah is 79% Syrah, 7% Petite Sirah, 6% Mourvedre, 3.5% Touriga Nacional, 2.6% Viognier, 1.6% Chardonny, and 0.3% Muscat. It is 35% Eleven Confessions vyd, 31% The Third Twin, 27% Cumulus, 5% White Hawk, and 2% Bien Nacido vyd. 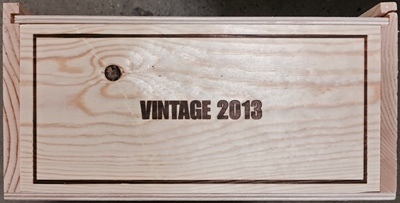 It spent about 25 months in 65% new French oak barrels. The rest were one to four years old. 28% whole clusters, 72% destemmed. Alcohol is 15.5%. Acidity is 6.8 g/l. Finished pH is 3.82. Shipped together in Spring 2016. 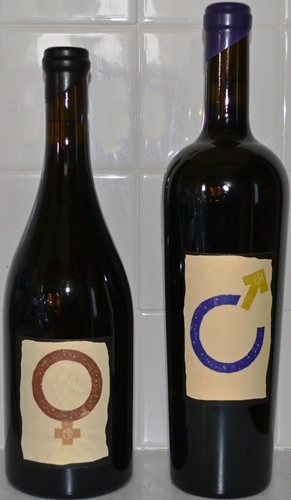 In the offer letter, the Grenache and Syrah were officially only named with the symbols ♀ and ♂, resp. 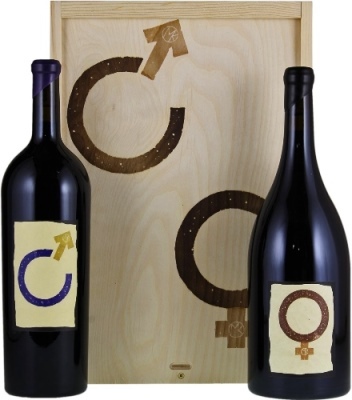 Since I needed to alphabetize the names, and Manfred introduces these names in his offer letter with, I have often (maybe always) referred to Syrah as a male and Grenache as a female, I started refering to them also as Female and Male, resp. For some reason (perhaps the TTB), on release the wines were officially named Female and Male, resp. I received a 6-pack of each. 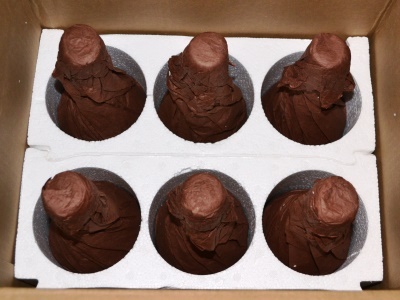 The Grenache came in brown tissue paper. 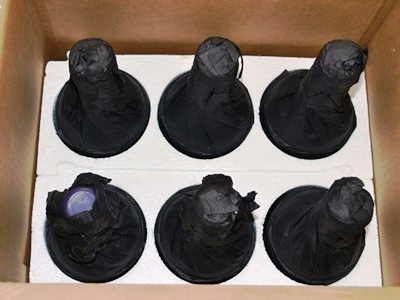 The Syrah came in black tissue paper. The Grenache has a black wax capsule. 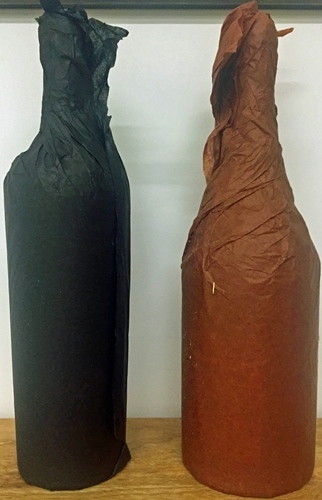 The Syrah has a purple wax capsule and is the taller bottle. 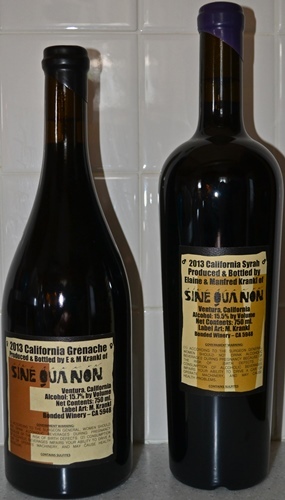 one Male Syrah (left) and one Female Grenache. 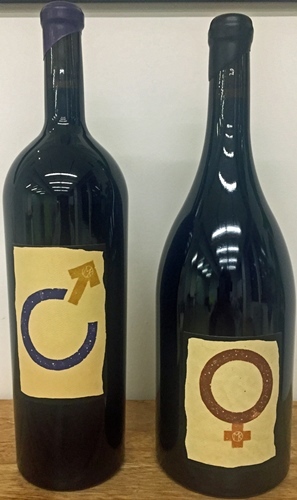 The winery has confirmed that no 3L bottles of ♀ or ♂ were made.